Hero is plain and simple, a performance and muscle powerhouse. 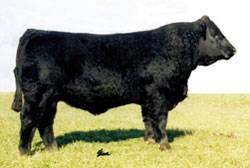 His outcross genetics can offer a much needed new direction if used properly on mature cows. His first daughters are in production and are proving to be high volume, heavy producers. Hero is not for everyone and not for all uses, but for the serious breeder looking for a breed changer with a different pedigree, he can be very effectively used, delivering great benefits.